Author and outdoorsman Eric Hanson recently wrote a succinct and passionate op ed piece that clearly describes the impact that the proposed mine will have on the Bad River watershed, which is next to Lake Superior. "To help us grasp the gigantic size of the proposed Penokee open pit mine, let's picture the mine superimposed on familiar Milwaukee-area geography and landmarks. "First, let's assess the proposed iron mine's length. Begin at the Summerfest grounds. Drive west past Miller Park - and the Zoo Interchange, too. Keep going past Moreland Road - and past the Waukesha airport as well. 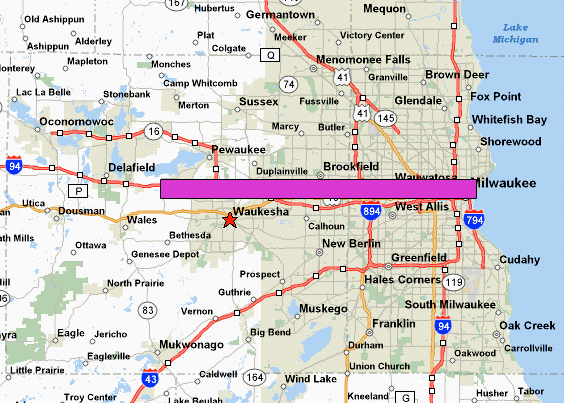 Drive until you are just a mile short of the west end of Pewaukee Lake. That is 22 miles, the length of the proposed Penokee mine project. "The mine would be a half-mile wide." I've created a visual aid to help with this. 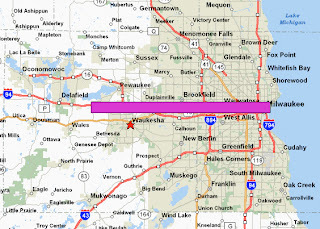 The pink bar on the map below, which reaches from Lake Michigan almost to Delafield, shows how long the mine would be. Hanson goes on to say, "This is not a mine our grandparents would recognize, a minor incision. This is the new style mining - a mountaintop removal mine project that would turn a unique part of northern Wisconsin into a West Virginia-like land of sorrow." I invite you to read the op ed, called "Enormous mine, enormous consequences," which was published by the Milwaukee Journal Feb. 19.